On March 14, 2019, Tropical Cyclone Idai made landfall near Beira City in the central part of Mozambique. The storm caused heavy rains, strong winds, and severe flooding in Mozambique, as well as in neighboring Malawi and Zimbabwe. Damage from the cyclone has caused problems with water and food supplies, sanitation, electricity, transportation, shelter, communications, security, medical care, and mosquito control. Contaminated drinking water and reduced access to safe water, food, and shelter in some areas may create conditions for outbreaks of infectious diseases. Cyclone Idai, aka “Africa’s Hurricane Katrina”, produced an “inland ocean” which stretched for thousands of square miles, soaking the homes, roads and belongings of some of the world’s most impoverished communities. The official death toll from the initial impact is already in the hundreds, with search and rescue operations ongoing. Many more than that total may ultimately lose their lives. According to Direct Relief, the muddy storm waters of Cyclone Idai contain multiple risks to human health. Cholera is foremost among these. 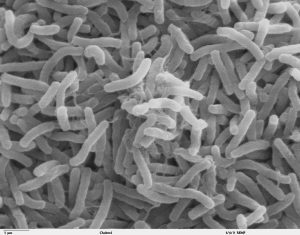 The area from Quelimane to Beira and inland across the border into Zimbabwe includes numerous areas which are considered under standard conditions to be high risk for cholera infections. Along with cholera, risks of waterborne illness include bacterial infections causing acute watery diarrhea, and typhoid, both of which are endemic throughout the storm-affected zone. Cyclone-strength storm winds tend to disrupt insect populations and may have an initial effect of reducing exposure to vector-borne diseases. However, central Mozambique has high burdens of malaria, dengue, chikungunya and other infections which are transmitted by mosquitos. Mozambique has the 10th highest malaria rate in the world at 337 cases per 100,000 population. As the storm waters recede and mosquito breeding grounds re-establish themselves, it is likely that people throughout this area may see spikes in vector-borne diseases.